If the title gives you the idea this will be a food purity rant attacking GMO's or tossing out buzzwords like Paleo or gluten or *puke* kale, this isn't that post. Such a rant may well come one day but there are people with far more passion and eloquence filling the interwebs with information and righteous rage right now and I'll let them take the helm. No, the corruption I wish to address tonight is cereal companies bastardizing the simple pleasures of setting fire to marshmallows speared on a green stick. Some corporate demon, whose name I won't mention, mostly because brand names go in one ear and out the other has released what they claim is a S'mores flavored breakfast cereal. Let's forget for a moment no one has ever scientifically proven what soilent greenesque ingredients make up the marshmallows found inside cereal boxes and hot cocoa packets but let me clear up a common misconception... MARSHMALLOWS AREN'T CRUNCHY IN NATURE unless applied to an open flame... or if you eat the raw root of the plant for which the true memory foam food was named. Also, if the marshmallow, when placed in a microwave, doesn't expand like a magic balloon and subsequently fill your dwelling with the smell of scorched sugar, it can't be considered a marshmallow. If there isn't an FDA ruling on this, shame on them and their screwed up priorities. A S'mores cereal? It can't be done! Sure, you can approximate the flavors of graham crackers, marshmallows and chocolate in a prepackaged box of chemicals and (rumor has it) alleged grains, intended to be eaten while it drowns in some type of milk-ish liquid... but the only milk that goes with s'mores is lukewarm, close to turning milk pulled from the bottom of a Coleman cooler and served in tin mugs around an open fire. Look, I know I'm one of the privileged few to have the experience of leaving the warmth and comfort of home and electricity to sleep in a canvas shelter on rocky ground while swatting mosquitoes and praying the snakes don't seek out my sleeping bag for warmth. Not a lot of people in younger generations understand eating fresh caught fish for breakfast or finding out just how versatile canned beans can be when fish aren't biting. 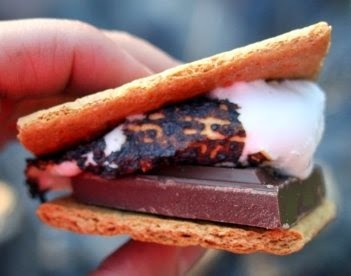 (Sadly, not great bait) I grew up eating s'mores the way God intended... standing around a smoky fire, in the dark, having pretend sword fights with the cooking sticks and seeking the ideal degree of browning on your marshmallow. 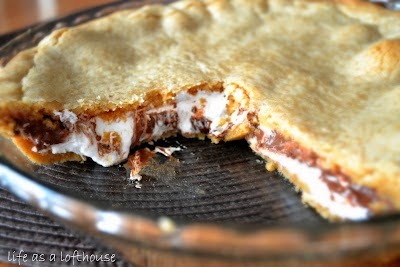 Growing impatient and setting it on fire, quickly extinguishing the fire, peeling off the charcoal crust and rushing over to the adult with the Hershey bar and graham crackers while the marshmallow is still squishy and warm enough to melt the chocolate causing both brown and white sweetness to ooze from the side of your cracker sandwich. Also part of the tradition of s'mores is when at least one person goes out of their way to remind you the origin of the treat's name. "Girl Scouts/Boy Scouts/Your Native Ancestors happened upon the concoction and they were so good, everyone was compelled to beg for s'more!" Without the passing of the legend, you are doing nothing more than stealing the rituals of proud campers and pyros of generations gone by. This muddying of our limited culture must be stopped. Part of the appeal of the treat is the conditions required to do it properly. If you don't go to lengths to set the proper tone, you're just stuffing your gob with something you can replenish with a trip to the pantry. Now, I'm not a s'mores addict... merely a purist. We`ve done them in the fireplace, over gas flame, over beeswax candles when the power went out... we, as a family, have tried them several ways, including (I`m shamed to admit) an electric oven... but the true s'more is cooked over an open, preferably wood, flame. S'mores and open wood flame are so inextricably linked in my psyche, the house could be engulfed in flame and I'd be looking for the marshmallows... But that's just me. Just know, if I ever see such an abomination as s'mores cereal in your home, our very relationship could hinge on you learning the difference between this horrible, chemical filled, atrocity and the time-honored chemical filled treat of the campfire.